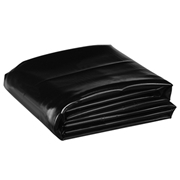 Polyethylene Pond Liners are extremely UV stable and able to withstand temperatures from 180°F to -70°F. Polyethylene Pond Liners are backed by a twenty-year warranty. The 20 mil medium-density polyethylene pond liner costs 25¢/ Sq. Ft. These prices are FOB Shawnee, OK and do not include shipping. The maximum size for fabricated one piece pond liners is 40,000 Sq. Ft. for 20 mil.